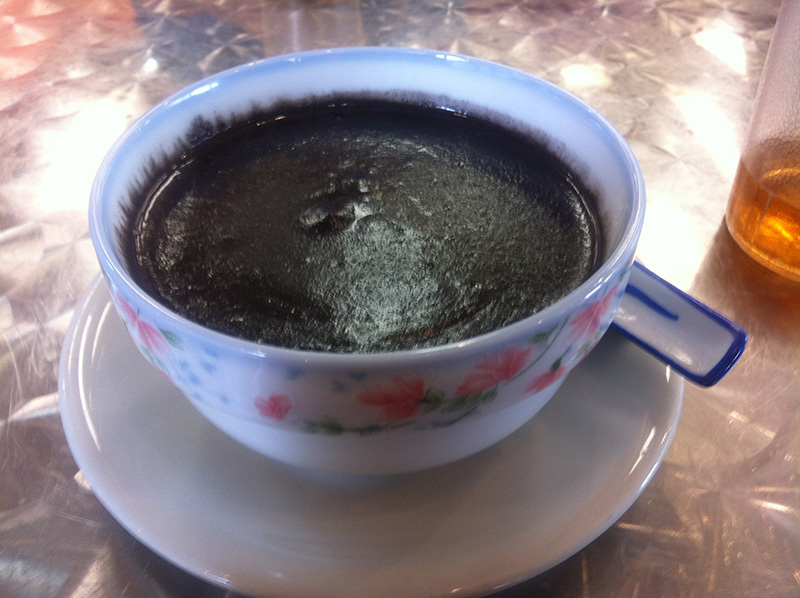 A bowl of warm, grainy, thick, dark liquid. 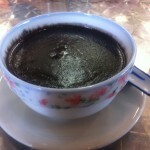 To be honest, it looked more like tar, or perhaps a mineral rich substance for a purpose other than consumption. I’m always bold when it comes to food so I tackled the first spoon. It was warm and thick and very rich and textury and quite sweet (it came with a sachet of sugar if it wasn’t sweet enough). I should also note that the sesame seed soup is not listed on the menu and that Chris had to order it specially with the owner. Following Andrew Zimmerman’s advice on always trying something twice before giving in, I gave it another spoonful but all it did was amplify the distinctive flavour and texture and I knew it was enough and left it there indicating politely that I was waiting for my mango pudding. It was a fun experience (particularly as we laughed at each other with resulting black teeth – a side effect of eating the soup) and I’m glad I did it among present company but next time, let the dessert connoisseur decide ok? 🙂 Haha, yes I am kidding.